In January of this year, I purchased a very nice Stylistic Q704 Tablet PC from Fujitsu’s online store. The unit shipped with Windows 7 installed, but I immediately upgraded to Windows 8.1 on the premise that it makes no sense to use a touch-oriented device with the less touch-friendly Windows 7 rather than its more touch-friendly (and current) 8.1 counterpart. Fujitsu even sent me a Windows 8.1 install DVD so I could do the upgrade myself. Once I gave up on Fujitsu and started looking for fingerprint scanner support on my own, I learned that Windows 8.1 itself provides basic device support in PC Settings. After working through that process, I quickly realized that Fujitsu provided no software to put the tablet’s fingerprint scanner nor its Near Field Communications (NFC) sensor to work. In conversations with the company’s tech support staff, I emerged under the impression that they would be releasing Windows 8.1 software for those two devices around the end of February. Thus when the first week of March came and went, and I saw nothing new on the support page for the Q704 for those devices, I contacted Fujitsu by e-mail to inquire further about the availability of this software. I received a reply saying that there has never been a delivery date published for those items, and that my understanding of the delivery date must therefore have been faulty (or perhaps, deluded). Sigh. Windows 8.1 includes a fingerprint registration application, thereby removing the need for a hardware manufacturer to provide such an application. This application is integrated with the account settings page in PC settings. 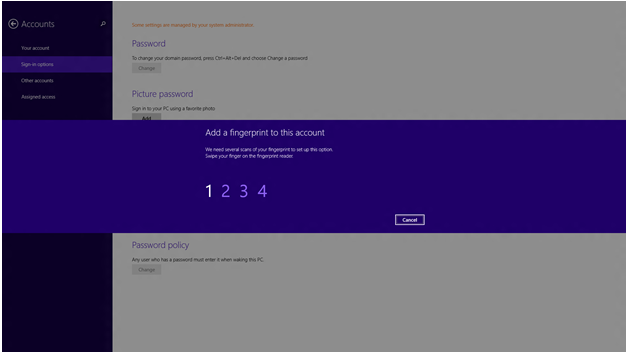 Furthermore, the article provides step-by-step instructions on how to register fingerprints with that built-in application, so that users can easily begin using the fingerprint scanner to log into Windows 8.1. Almost immediately after reading this article — set-up took less than two minutes — I was able to start using the fingerprint scanner that I had mistakenly believed to be unusable on the Fujitsu for lack of vendor-supplied software to support same. This raises the even more interesting question of “Why didn’t Fujitsu know about this?” (and to make sure they did, I emailed them again to tell them about what I’d learned, and to point them at the TechNet article with the step-by-step instructions others can use to put their fingerprint scanners to work under Windows 8.1). Now, if only I could find something similar for the NFC device. It looks like I can download some example applications from MSDN to put that device to work, but that’s going to require downloading and installing Visual Studio on that machine. I’m not sure I want to do that on a mobile device with limited storage space, but I’m pondering that possibility right now. If anybody knows of other options for NFC on Windows 8.1 (surely, there’s got to be some commercial software out there?) please let me know! It all goes to show that while information from Tech Support may be nice, and sometimes helpful, it’s still up to those who own the devices to root around and figure out how to get things working. Otherwise, one might have to wait for the infernal regions to ice up before obtaining genuine relief!